Pull up a chair and place your bets! How many rounds can you last going head-to-head with 12 other blackjack masters? In Super Blackjack Battle 2 Turbo Edition you will put your card playing skills to the test for 10 rounds in a variety of stages across different countries, leading up to the ultimate battle in Las Vegas, Nevada. One would think a title like Super Blackjack Battle 2 Turbo Edition sounds pretty straightforward, and they would be right, because that’s exactly what this game is: blackjack. Each round goes similarly to a regular round of blackjack, even going so far as to include mechanics such as insurance and splitting bets. Each of the 12 unique players has their own light backstory, which adds humor and entertainment between high stakes hands. Additionally, the characters have a special, personalized saying for every opponent after defeating them, which gives some insight into their backstory as well. What makes Super Blackjack Battle 2 Turbo Edition stand out is its unique style and environments that serve as the backdrops for each stage. While the gameplay is simple and straightforward, the music and art keep the game from being boring in places where it easily could be. Each of the 12 opponents have their own home poker table and environment to represent their culture or country. Whether it’s the crashing waves in Luke’s Australia stage or the matador fight happening in the background of Julian’s Spain stage, I found myself thoroughly entertained by the art in this game. To accompany such unique locations, Super Blackjack Battle 2 Turbo Edition provides an amazing soundtrack. Each stage has its own retro-styled song to match the country or environment behind it, and as the match progresses, so does the music, which gets faster and faster in the last four rounds. Super Blackjack Battle 2 Turbo Edition offers more than just these 12 stories. In addition to the single player story mode, there is a party mode and a simple blackjack mode. The latter of which is exactly as the title suggests: an arcade style mode where players go up against only the dealer until they run out of money. This mode seems a bit pointless however, considering the entire story mode is just blackjack with a higher entertainment value. Party mode can definitely be a good time if you’ve got some friends around. 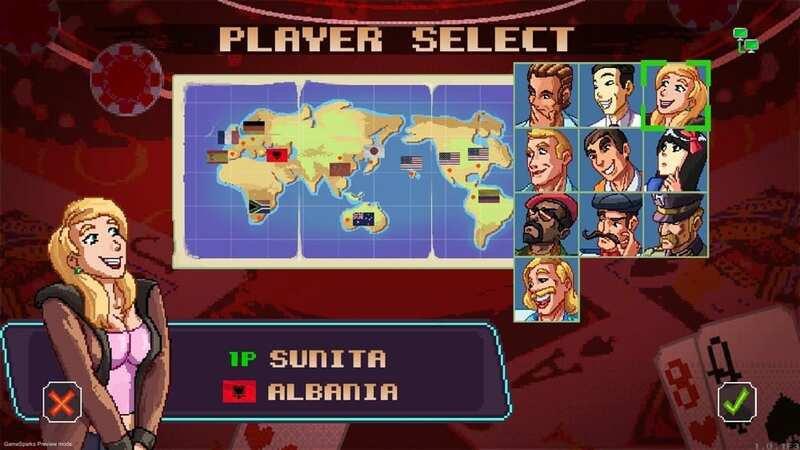 Up to four players can select a character and head into a battle similar to that in story mode, including the previously mentioned 10 rounds. A great feature is being able to play party mode all on one controller, which made it more accessible. 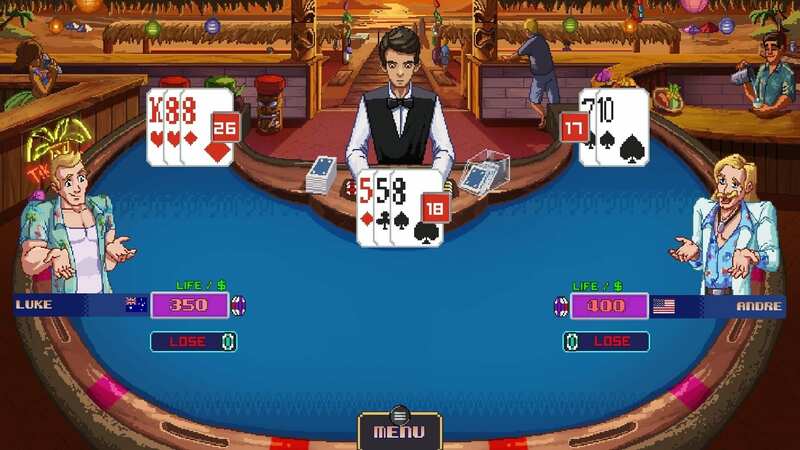 While overall Super Blackjack Battle 2 Turbo Edition is a very entertaining take on a classic card game, it is not without its shortcomings. If you want to get the most out of this game, then you will have to play multiple characters’ stories and, consequently, you’ll realize just how predictable the betting styles for certain characters are. Julian in Spain tends to bet in a more fast and loose style, which makes games against him last far less than 10 rounds, but also makes playing against him pretty boring once you catch on. Even when the pattern isn’t as obvious, characters never tend to bet more than 20 or 40 percent of their money. Without a difficulty setting to change things up this can make battles against the same character, even in separate runs, a bit dull. In addition to being predictable, these characters don’t have great, or sometimes even good, backstory. I’m not expecting an RPG-quality story for each of these competitors, but if there is going to be a backstory, I would at least like a little more information. Some characters do have a few twist endings to their stories, but others will end with a shot of them simply buying a plane with their earnings, making the lead up feel as if it had not been worth the effort. If playing blackjack for hours on end and peeking into the lives of a few oddball characters is your thing, then Super Blackjack Battle 2 Turbo Edition is certainly for you. This game could have easily been a bland card game simulator, but it truly goes above and beyond expectations to provide a unique approach to a classic poker game. Players may even find themselves wanting to play more blackjack than ever before. I know I did! 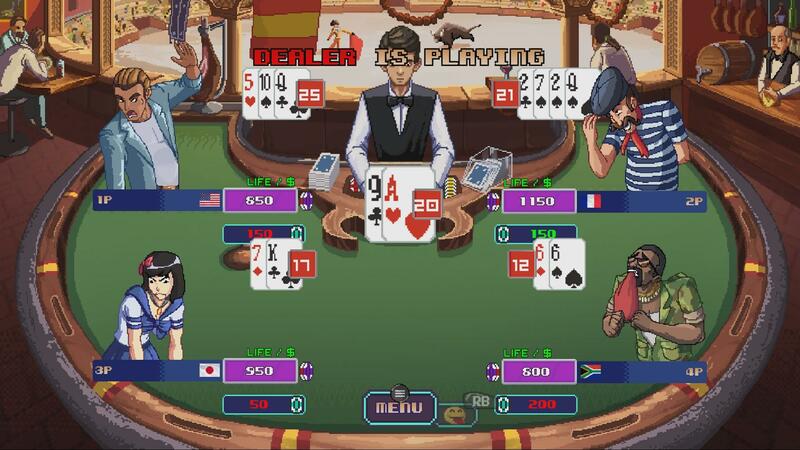 Michelle reviewed Super Blackjack Battle 2 on Xbox One with a code provided by the publisher. Review: Food Fantasy - Appetizing Journey or Food Poisoning?